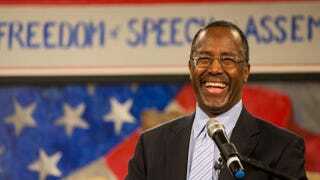 Ben Carson speaks at the South Carolina Tea Party Coalition Convention on Jan. 18, 2015, in Myrtle Beach, S.C. A variety of conservative presidential hopefuls spoke at the gathering on the second day of the three-day event. But it’s what Carson told me Monday at the Capitol Hill office of his business manager and political adviser, Armstrong Williams, while casually grabbing lunch in between Martin Luther King Jr. holiday appearances—including a live town hall meeting on the state of American race relations, where Carson shared the stage with attorney Benjamin Crump, who has represented the families of Trayvon Martin, Michael Brown and Tamir Rice. It’s a statement that actually makes Carson’s occasional suggestions that he may be divinely inspired to run for president sound almost modest by comparison. Technically, he’s still making up his mind about 2016. But on Monday, it sounded to me a lot like his hat is already in the ring. Which seems to frame the question: Is Carson for real? I’ve questioned his readiness for prime time a number of times—just read here and here—based, among other things, on the fact that he’s never run for or held office. He’s encountered a series of speed bumps, like BuzzFeed’s recent report about Carson’s failure to properly attribute sources in his book America the Beautiful: Rediscovering What Made This Country Great, or the National Review’s recent story about Carson’s too-close-for-comfort relationship with a medical supplement company that’s been sued for false statements about its products. Or the fact that it now looks likely that if he runs, he’d compete with GOP heavyweights like Mitt Romney and Jeb Bush. In our conversation, though, Carson directed more of his criticism toward President Barack Obama. In Obama’s 2004 speech, declaring that he didn’t see a red or blue America, only the United States of America, Obama appealed to Americans across the spectrum, but now, Carson said, “Instead what you get is, ‘These rich people are keeping you from getting this,’ and, you know, division all the time. You know, the police act badly and they’re against you. So, you don’t really see this theme that was so attractive when he was running, of bringing people together. “You know, when you get to know somebody, all of a sudden, the horns disappear,” he said. It’s not exactly a specific policy agenda. He’s more specific, though, about replacing Obamacare with health savings accounts. Which makes it hard to picture exactly what a typical hospital emergency room would look like in Ben Carson’s America, but maybe we’ll find out as the presidential election cycle rolls along. Will he run? I think so. Will he notch a primary win in an early state? Could happen. But with his current formula—being the nonpolitician politician in the field who’s actually pretty good at the political art of giving answers that aren’t exactly answers—is there a strong chance he’ll simultaneously attract the 15-20 percent of the black vote he’d likely need in a general election while outdueling the Bushes and Romneys? Right now I’d say that anything’s possible, but not exactly.